Being taken to the ground in a fight is a scary thing for most people. It often happens, but most people have few ground skills so they are vulnerable. If you find yourself on your back on the ground and the attacker has dropped down in between your legs, he is often also trying to punch or choke you. Here you are vulnerable if you stay put. 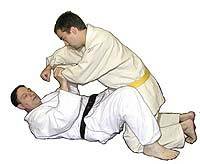 One tactic often used is to lock your legs around the opponent so the attacker can’t get above your legs into a position where he or she can straddle you in a riding position, and more easily punch, choke or otherwise attack you. But even if your opponent is locked with your legs, you can be attacked. Here you are in real trouble if you can’t escape or counter – something that takes considerable skill. One variation on defense that I show is an alternative leg technique. 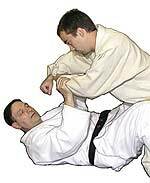 The defender either grabs or traps the attacker’s right wrist or both wrists, and places his feet on either side of the attacker’s waist. As the defender’s legs push the attacker’s waist away, he should pull the attacker’s wrists to his face. This action causes the attacker’s arms to be over extended, and he is off balanced and not in the position to be striking the defender. The defender’s left leg goes across the attacker’s throat and right arm. As the defender rotates his body clockwise to the right, this overextends the attacker’s right arm. Now the defender has an arm lock on the attacker. The attacker's hands are attempting to choke or punch at the defender's face. As the defender's hands pull the attacker's wrists (over extending his elbows) to his face, the defender's left leg wraps over the attacker's right arm and across his throat. As the defender turns his body clockwise, he continues to pull on the attacker's right arm and extend his left leg across the attacker's neck. This action causes an arm lock.